Car hire Knock airport Ireland West Knock Airport provides discount car rental from the following rent a car companies in the West of Ireland. 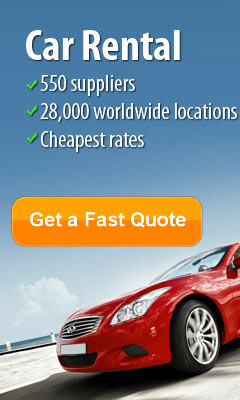 Hertz, Avis, Budget, Irish Car Rentals Sixt, Thrifty Europcar. 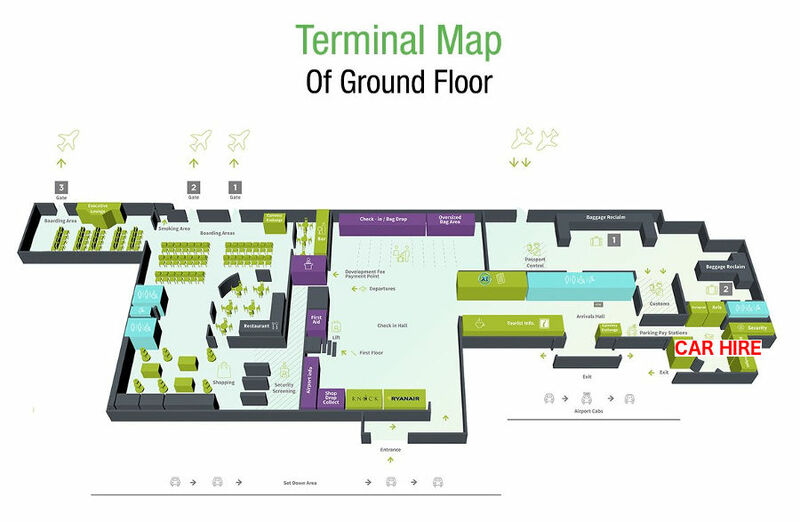 If you are touring the Wild Atlantic Way Ireland West Airport is a great location to pick up your car. 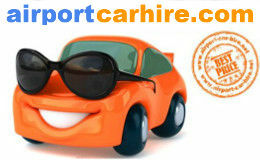 One way rentals ace available so you could drop off your hire car in Shannon Airport or Cork Airport. 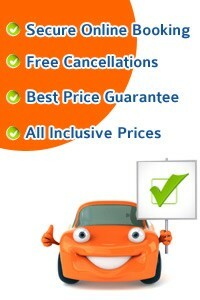 Take this opportunity to get the best car rental deals in Ireland West... CHEAPER. Knock is a small village in the County of Mayo in the West of Ireland, Knock Shrine is a Catholic Marian Shrine, believed to have been visited by the Virgin Mary, St Joseph and St John the Evangelist. Large numbers of visitors come to Knock Shrine each year. 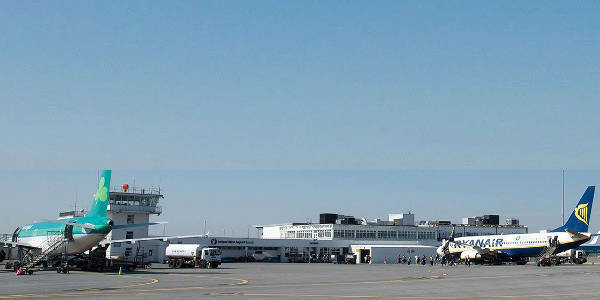 If you are renting a car at Knock Airport you can drive around and explore the County Mayo area, with lots to be seen and explored such as Croagh Patrick, another area which pilgrims flock to in the Summer months, believed that St Patrick fasted on this mountain and built a church there and today people continue to visit Croagh Patrick. Westport also is a very popular town in County Mayo, at the foot of Croagh Patrick and a short distance to the stunning Clew Bay area. Westport comes alive in the Summer, this heritage town is beautifully laid out and beautifully looked after with its many hanging baskets and interesting shop fronts and streets. Visit Westport House and Country Park also. The Achill Island off the coast of Mayo, is breath taking all year round, a great place to get away from it all, enjoy driving around the Island, the Atlanctic Drive and meet some of the locals, and soon you will fall in with the slow pace of life. Take a bike with you and cycle around Achill Island or stroll and be sure to take in the Great Western Greenway, which can start at Achill Sound and finish in Westport, a track especially for cyclists or walkers. This lovely area of County Mayo has many Blue Flag wonderful Beaches in Achill such as Keem Bay, Trawmore Strand, The Silver Strand and The Golden Strand. The Céide Fields in County Mayo is one of the oldest field system which was discovered, a unique Neolithic landscape area of great importance, with field walls, houses and megalithic tombs all there, Irelands History is preserved in this area, something for all history enthusiasts. The area of Cong in County Mayo is a very scenic area, and you are sure to enjoy some wonderful drives around this area, and it is also home to where the Quiet Man staring John Wayne and Maureen O'Hara was filmed. McWilliam Park Hotel, Knock Road , Claremorris, Co Mayo The McWilliam Park Hotel is a new 4**** star Hotel located in Claremorris, Co Mayo, Ireland and has been open for business since October 2006. The Hotel offers 103 beautifully decorated Bedrooms, a stylish Restaurant using the finest of local produce along with a state of the art leisure complex with pool, gym, sauna & steam room. The McWilliam Park Banqueting Suite can cater for up to 400 people, The Conference suite can cater for up to 600 delegates. Lynch Breaffy Woods Hotel offers a great countryside location, and 128 guest rooms, 26 semi self-catering family lodges and interconnecting family suites. Great sports and leisure facilities are available for the whole family. Relax in the Kingfisher Aqua and Fitness Centre. The centre has an indoor pool, a fully equipped gym, 3 water therapy pool beds including a volcano feature and water curtain, sauna and Jacuzzi. Legends Restaurant offers informal dining in a relaxed atmosphere, overlooking Breaffy's grounds and river. Wood's Bar is located on the 1st floor and has lively entertainment every Friday and Saturday night. Knock House Hotel, Ballyhaunis Road, Knock In the heart of the countryside, Knock House Hotel provides free Wi-Fi and free parking. Knock House provides a free coach pick-up and drop-off service for guests. The rooms at Knock House Hotel have TVs, radio and tea/coffee. The Four Seasons Restaurant offers a menu of local and international dishes. Knock House Hotel is a 20-minute drive from Ireland West Airport Knock. Knock Shrine is close by and Claremorris Train Station is a 10-minute drive away. Cill Aodain Hotel Historic Kiltimagh, a typical rural artisan village nestled in the heart of County Mayo, is the setting for the Cill Aodain, where you'll find lrish hospitality is at its best. The Cill Aodain has been recently refurbished and its candle lit dining room specialises in continental and country cuisine with the best of local produce served with flair and imagination. The bar is friendly and intimate with panelled lounges and open fires. Kiltimagh offers visitors a variety of activities, including the Sculpture Park, Artist's Retreat, village museum and children's fun park. It is also only ten minutes drive from Knock Marian Shrine, one of Europe's foremost shrines. Horse riding, fishing, golf and mapped walking routes are all close by. - Jack Ryan / Boston.